The Moki Queen Pictograph is located in the North Wash Area between Hanksville and Hite, Utah. 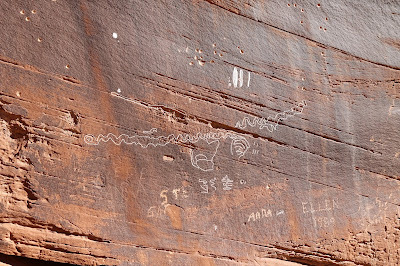 The remarkable pictograph can be found within an alcove just above North Wash about a quarter mile south of the Hog Spring Rest Area along Utah Highway 95. Also within the alcove are the fallen remains of a number of cliff dwellings and a few petroglyphs. The Hog Spring Rest Area is 33 miles south of Hanksville on UT-95. A person could try to park along the road across from the alcove but parking at the rest area is much safer. From the parking area follow one of the social trails near the restroom that lead down to North Wash. The stream is shallow but the sand can be deep so stick to the rocks or the gravely bed of the stream itself. The alternative to hiking down here is to walk along the shoulder of the highway and then to cross the wash below the alcove. From the wash below the alcove there is a well worn trail that is easy to spot. The trail forms a loop that enters the alcove on one end and exits at the other end. The alcove itself is filled with a massive amount of loose rocks and boulders. While all the rocks supplied plenty of building materials for the alcoves former inhabitants it is a nasty mess to hike in. The Moki Queen graces a flat section of cliff at the south end of the alcove. The amount of detail in the image must have been quite the sight to behold when it was freshly made. Rubble from the fallen walls of the rooms that once lined the alcove are all that are left of what may have been the home to multiple families. Bits of mortar and plaster can be seen among the rocks in places. There are a few bighorn petroglyphs an one boulder as well as some concentric circles and a few other images like this bighorn in the north end of the alcove. This panel of petroglyphs can be found on the opposite side of the highway closer to the parking area. 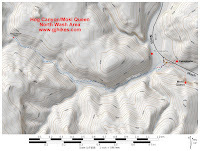 Its location is marked on the map that is included with this post. The illusive Moki Queen is a captivating pictograph that is well worth taking the time to see. We say illusive because there is a picture of it on a kiosk near the picnic area that mentions that it is nearby but doesn't give any further information on where that might be. If you happen to be in the area and would like to see it for yourself then all you have to do is 'Take a hike'.